Posted on 07 July 2013. As I was finishing up my Easter egg breakfast, Belinda came to wipe my face of egg and take me to get ready for the party. “Are you egg-cited for the party?” she giggled. I was excited, I loved parties! I licked her face and barked a loud bark! We went into the bathroom and she started filling up an oatmeal bubble bath for me. I readily jumped into the sudsy tub and started running in circles, slipping and sliding on the wet surface. Bath time was a fun time for me! Belinda scrubbed me really good, from my tail to my nose. When we were done, she took me out and wrapped me in a towel like a baby. This was my favorite part because she always carried me around the house like that and sang to me. 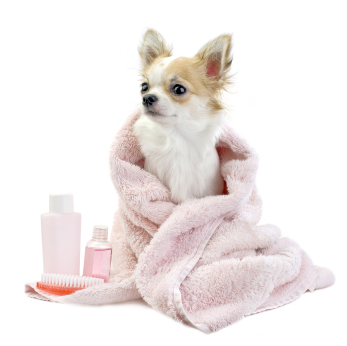 After our bath time ritual, she dried me quick with a blow dryer and spritzed me with her home-made Chihuahua spray. I was really easy to dry because short haired Chihuahuas don’t have much hair to dry! “Time to get dressed, my little baby!” We went into the bedroom and Belinda got a special box out from her closet. She took off the lid and I was so surprised! Inside was a furry yellow one-piece Chihuahua outfit. The hood had two black buttons for eyes and a little orange beak and there was a tuft of orange feathers on the bum. The Chihuahua collar was sparkly and yellow with a little chick charm hanging from it. I was going to look like a baby chick! This was one of the most beautiful Chihuahua outfits I owned and I was so excited to wear it! Once I had my outfit on, I was absolutely adorable. I was so proud of my new Chihuahua clothes that I pranced around with my little head held high. My beak stuck out and my feathery bum wagged back and forth. “This is priceless, John. Come see Buster!” John came into the bedroom and I paraded around for him. Everybody was laughing and I loved being the center of attention. John was videotaping me and Belinda was snapping pictures with her camera phone. “I can’t wait to send these to everyone I know” said Belinda. John finished taping me while Belinda went back to work in the kitchen to get ready for the big party. “Don’t get dirty, Buster. You look really nice! Great outfit!” said John. I was so happy to be an Easter chicken! My day started off weird with the rabbit in my bed and no breakfast when I woke up, but it’s turning out to be a really fun day and I can’t wait for the party! When all of the kids get here, we will have wonderful things to eat all afternoon! Music will play and we will all sing and dance. We will hunt for Easter eggs, and play other games, too! It’s going to be the best day ever!